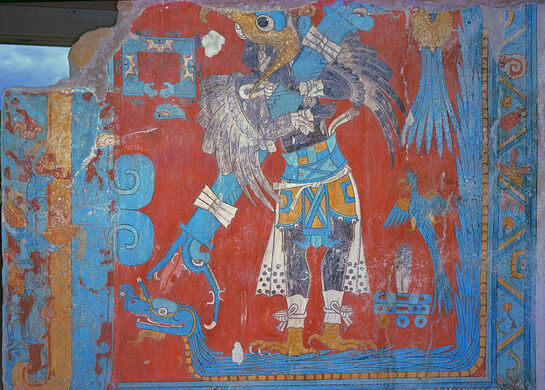 These strikingly colorful paintings were created by a mysterious Mesoamerican civilization. Cacaxtla is one of the less-visited Mesoamerican archeological sites. As such, it’s unlikely you’ll see hordes of tourists while you visit. But you will, however, see a fantastic array of art. A scientific repository of goiters, boils and other ailments throughout Mexican history. Shocking dioramas of human torture, meant to promote human rights awareness. The civilization that settled Cacaxtla (often referred to as the Olmeca-Xicalanca) is an enduring mystery that has puzzled archeologists and historians since the discovery of the site. However, the paintings they created contain some characteristics that give clues as to who they were. 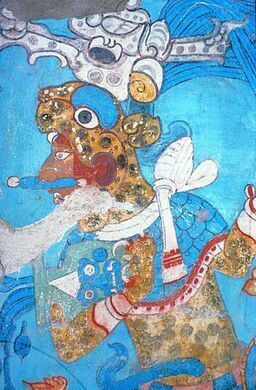 The use of the color known as “Mayan blue” and the stylistic elements of the paintings hint that they were probably a culture related to the Mayans or of Mayan settler origin. Another striking mural in the site shows two mysterious figures, thought to represent rulers, that have been painted onto columns. One known as “The Bird Man” is dressed in an eagle costume, carries a large staff, and stands upon a grinning plumed serpent that resembles a Chinese dragon. Archaeologists believe this entity may represent the god Quetzalcoatl. To the right of the birdman is a long-tailed bird known as the resplendent quetzal, a species that was sacred in Mesoamerica. The other column portrays a man dressed in the skin of a jaguar, similarly carrying a staff which droplets of water fall from. The jaguar man stands upon the back of a ferocious beast resembling a dragon-like serpent with the claws and spotted skin of a jaguar and is believed to represent a god associated with rain and fertility. A mural archeologists call “The Temple of Venus” is also painted on some columns. On the right side, a masked, blue-skinned, and scorpion-tailed male entity wears a jaguar skin kilt bearing a symbol of Venus. A cryptic blue female figure can be seen on the left column, also wearing a skirt featuring the iconography of Venus. 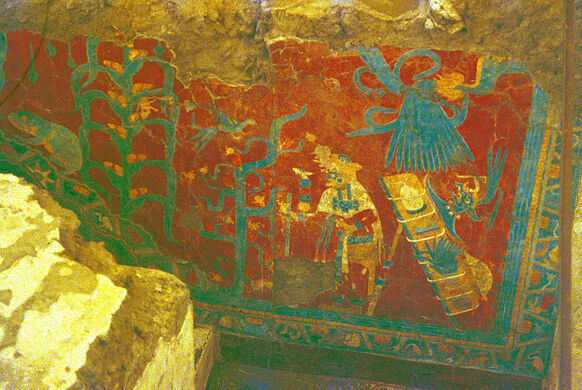 The last mural to be seen in Cacaxtla is located on a stairwell and shows what is probably a deity associated with agriculture and the cultivation of maize anointing a field of corn. A quetzal is seen flying above the crop while a bashful-looking toad creeps through the stalks. If arriving from Mexico city, go to the San Lazaro bus terminal (you can get there by metro) and take a TAPO bus to the city of Tlaxcala, which takes about three hours. If arriving from Puebla, go to the Centro de Autobuses Puebla (CAPU) bus terminal and take an Estrella Roja bus to Tlaxcala. Once you have reached Tlaxcala and disembarked from the bus, you will need to take a registered taxi to reach the archeological site, this is likely to take about half an hour and is relatively cheap. Entrance to the archeological site costs $60 Mexican pesos, including entrance to the museum. The site is open every day from 9 a.m. to 5:30 p.m. and is covered by a roof so you won't get soaking wet if it rains. Close by is another archeological site, Xochitecatl, comprising a small pyramid that although not as impressive as Cacaxtla is also worth visiting. Over 75 historically themed murals grace the walls of a small Washington city.